Pressure-assisted flushing gives you the performance you expect even when your light commercial applications require lower flush volumes. Sloan invented pressurized flushing, and no other company has sold more pressure-assisted products. With a Flushmate® vessel supplying the pressure and Sloan's reputation for durability providing peace of mind, you'll be confident in your toilets' performance for years to come. Here's what you can expect from a Sloan pressure-assisted toilet. 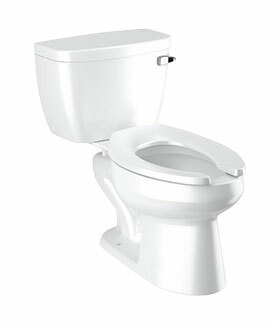 Your Sloan pressure-assisted toilet looks like an ordinary tank-type toilet, and people flush it the ordinary way. Its performance, however, is anything but ordinary. Even the highest-traffic toilets will be far less likely to back up or clog, because pressure supplied by the Flushmate vessel pushes waste out of the bowl and into the drainline far faster than a gravity flush. 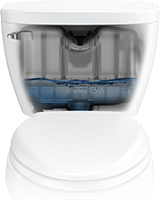 With Sloan's pressure-assisted toilets you'll also notice a cleaner bowl, because the higher velocity and pressure of the rim jets creates a better scrub. Plus, with no flappers, chains or clunky multi-linkage mechanisms, these toilets offer smooth, quiet, trouble-free flush activation and easy maintenance. 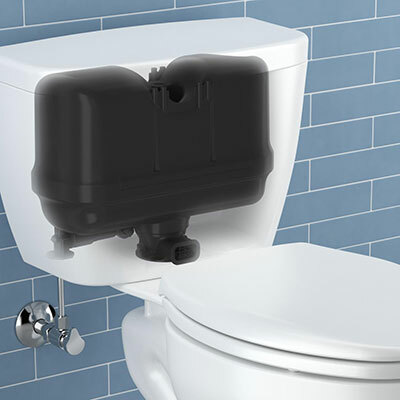 Sloan's pressure-assisted toilets deliver the drainline performance of flushometers. Simple and cost-effective, they install exactly the same way as gravity toilets and require the same basic water supply pressure (20–25 psi). They require no extra infrastructure at all, so you can easily upgrade from your gravity tank toilets. Yet they deliver performance similar to flushometer toilets—even at flush volumes as low as 1 gallon per flush. By pushing waste out of the bowl at a higher flow rate, these toilets deliver up to 50% longer drainline carry than gravity toilets, so you'll experience far fewer drainline stoppages. 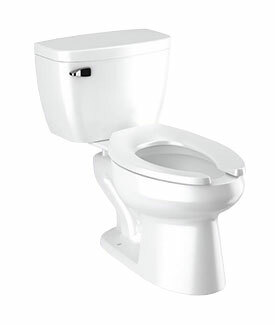 Your Sloan® pressure-assisted toilet looks like an ordinary tank-type toilet, and people flush it the ordinary way. Its performance, however, is anything but ordinary. Even the highest-traffic toilets will be far less likely to back up or clog, because the pressure supplied by the Flushmate® vessel pushes waste out of the bowl and into the drainline far faster than a gravity flush. A cleaner bowl, because the rim jets have higher velocity and pressure that create a better scrub. 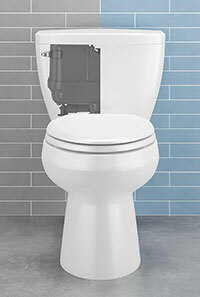 Fewer "double flushes", because the higher pressure clears the drainline on the first flush. Sustainable water savings because, unlike gravity toilets with flush volumes that can be manipulated, Sloan pressure-assisted toilets are non-adjustable. No condensation due to the insulated tank. Smooth, quiet, trouble-free activation because Sloan pressure-assisted toilets have no flappers, no chains and no clunky multi-linkage mechanisms. and your maintenance costs low with Sloan pressure-assisted toilets.